No. 8 UCF lost quarterback McKenzie Milton to injury but still trounced South Florida 38-10 on Friday to extend the nation's longest winning streak to 24 games and complete a second consecutive undefeated regular season. 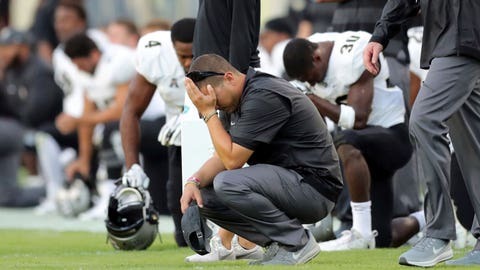 TAMPA, Fla. (AP) — McKenzie Milton‘s teammates crowded around the injured UCF quarterback, some kneeling in prayer and others offering comforting words. “Our guys care deeply about everybody on our football team, and certainly McKenzie,” coach Josh Heupel said after the eighth-ranked Knights rebounded from losing their leader to an apparent right knee injury to finish a 38-10 rout of intrastate rival South Florida on Friday. Central Florida (11-0, 8-0, No. 9 CFP) extended the nation’s longest winning streak to 24 and completed a second consecutive undefeated regular season. Heupel would not confirm the nature or severity of Milton’s injury. Still, it seems unlikely the junior from Kapolei, Hawaii, will play again anytime soon. Milton, eighth in Heisman Trophy balloting a year ago, hurt his knee when he was tackled at the end of a 5-yard run in the second quarter. Darriel Mack Jr. replaced him and probably will make his second start of the year when UCF faces Memphis next week in the American Athletic Conference title game. Players from both schools, which are located about 100 miles apart via Interstate 4, kneeled on one knee while a cart was rolled onto the field and Milton received medical attention in front of the South Florida bench. The entire UCF squad left their sideline at one point to form a crowded circle around Milton, who was placed on the cart and taken to the locker room and later a nearby hospital. Heupel said he didn’t have a clear view of the play from the sideline. Before leaving, Milton completed 5 of 10 passes for 86 yards, including a 14-yard scoring throw to Gabriel Davis for a 7-0 lead. The Knights kicked a field goal on the first play after the quarterback departed to make it 10-0. Mack got plenty of help from a talented supporting cast that includes Greg McCrae to make sure UCF finished the job. South Florida (7-5, 3-5) finished the regular season on a five-game losing streak, its longest skid since 2013. McCrae scored on runs of 40, 39 and 31 yards, with the second of the three TDs re-establishing a 14-point after South Florida briefly pulled to 17-10 on Johnny Ford’s 34-yard catch-and-run for the Bulls‘ only touchdown. McCrae finished with 181 yards rushing on 16 carries for the Knights, who have scored at least 30 points in 24 consecutive games — matching South Florida (2015-17) for the longest such streak since 1939. Ford rushed for 120 yards on 16 attempts for South Florida, which played without injured quarterback Blake Barnett (shoulder/ankle). UCF: The Knights lost Milton, but were still good enough to take care of their intrastate rival. Mack also led the team to a 37-10 road victory over East Carolina while Milton was sidelined with an undisclosed injury on Oct. 20. South Florida: After a 7-0 start, the Bulls faded quickly down the stretch. The defense is partly responsible, allowing 57, 41, 35, 27 and 38 points in losses to Houston, Tulane, Cincinnati, Temple and UCF, but the offense had difficulty sustaining drives and getting in the end zone. UCF has won two straight in the series South Florida leads 6-4. Since 2016, the rivalry has been dubbed the “War on I-4” and the winner is presented with a traveling trophy that’s 4-foot, 3 inches in height and weighs 160 pounds. The Knights climbed three spots in the AP poll after dominating Cincinnati on national television and have done everything they can to remain in the top 10 for at least another week by beating South Florida. UCF is No. 9 in the latest CFP rankings, the highest spot ever occupied by an AAC team. UCF: Hosts AAC championship game against Memphis next Saturday.